Unscrew cap and check that the fluid level in the reservoir is at maximum. Fluid level in the reservoir shall not exceed the MAX mark. If fluid has to be added, it is suggested to use the brake fluid in table “Fluids and lubricants” (see chapter “Technical specifications”). When opening cap take the utmost care to prevent impurities entering the tank. For topping up, always use a funnel with integrated filter with mesh equal to or lower than 0.12 mm. 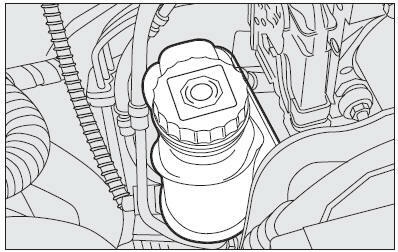 IMPORTANT Brake fluid absorbs moisture; for this reason, if the car is mainly used in areas with a high degree of atmospheric humidity, the fluid should be replaced at more frequent intervals than specified in the “Service schedule”. highly corrosive brake fluid does not drip onto the paintwork. If it does, wash it off immediately with water. and highly corrosive. In the event of accidental contact, wash the parts involved immediately with neutral soap and water, then rinse thoroughly. Call the doctor immediately if the fluid is swallowed. synthetic brake fluid, distinguishing it from the mineral kind. Using mineral fluids irreversibly damages the special braking system rubber seals.